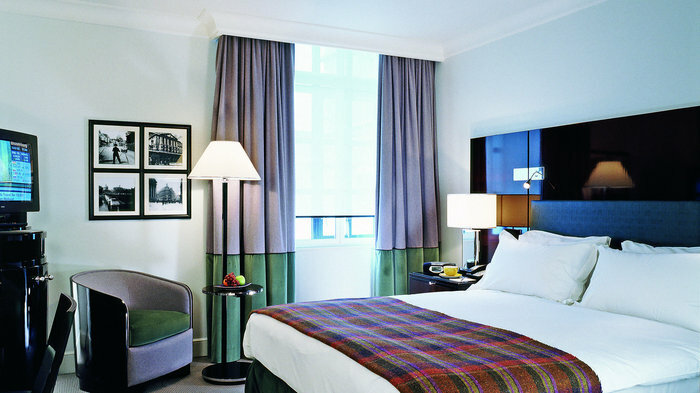 Housed in the former home of Cox's and King's bank, the Sofitel London St James is a lesson in understated elegance. Cleverly combining traditional British design with contemporary French chic, it features a restaurant inspired by Coco Chanel's 1920s Parisian apartment and a striking marble spa. An exceptional five star hotel with a wonderfully central location. Located in a Grade II listed building, in the former home of Cox's and King's bank, the Sofitel St James is an exceptional five star hotel in a wonderfully central location, just minutes from Trafalgar Square. Sympathetic renovations cleverly combine traditional British design with contemporary French chic. It is also the perfect place to unwind with a gym, spa and its own reputable French brasserie, The Balcon, located on the ground floor. Designed by Russell Sage, this restaurant is inspired by Coco Chanel's 1920s Parisian apartment. When tasked with designing The Balcon, the restaurant at Sofitel London St James, Russell Sage took inspiration from the interior design within Coco Chanel's 1920s Parisian apartment. The result is a grand brasserie serving French-British food in beautiful surroundings with the period detailing you would expect from a listed building - the double-height space used to be the banking hall of Cox and Kings Bank. Russell Sage Studios have worked on several high profile projects in London including The Savoy and the Royal Suite at The Goring as well as the bar at the Zetter Townhouse. At The Balcon the interior is all wrought iron ballustrades and spiral staircases that lead up to the champagne bar - this is a French brasserie after all, a champagne bar is 'de rigueur', naturellement. The menu is unasshamedly French too with garlic heavily accenting dishes like Herefordshire snails and pig's head terrine while Parisian style ham cooked in broth leaves no doubt as to its origin. There's a charcuterie section where dried saucisson and game salami are served with homemade pickles, condiments and toast. Mains are divided into cooking styles of rotisserie, slow cooked and en cocotte, or pan and grill. Examples include choices of Scottish beef and foie gras cottage pie with chanterelle mushrooms, or Devon rose lamb neck served with barley stew, girolle mushrooms, chestnuts and thyme puff pastry as well as pan-fried black bream with braised fennel, sea weed and beurre blanc. Tres grand. An overtly glamorous destination that's ideal for supping on champagne. With plush velvet seating and chinoiserie touches, the St James Bar within the Sofitel hotel is an overtly glamorous destination. Like its neighbouring restaurant, The Balcon, the bar is also inspired by Coco Chanel's 1920s Parisian apartment, making it a classy choice for a glass of champagne or a cocktail. Afternoon tea is given a French twist in this intimate lounge. With inviting pink sofas and a roaring fireplace, The Rose Lounge at the Sofitel St James hotel is an inviting destination to enjoy afternoon tea. With the Sofitel renowned for successfully combining British design with contemporary French chic, The Rose Lounge puts a French twist on this very British tradition. As well as the traditional finger sandwiches and scones, parisienne pastries are served alongside an exclusive range of teas and a rose and litchi champagne cocktail. Guests are also treated to the gentle sound of a harp while enjoying the intimate dining experience. A striking relaxation space, with marble and modern design. Opened in July 2009, So SPA by Sofitel is a stunning relaxation space - all marble and modern design - housed within the Sofitel St James hotel where a 'spa butler' ensures your every need is catered for. Located in a landmark listed building (a former bank) in St James, one of the most prestigious locations in London, the hotel is a lesson in understated elegance with design features accentuated by a French accent. There's even a large topiary French poodle overlooking the garden. The spa consists of five treatment rooms spread out over three floors with a Turkish steam bath (or hamam) featuring a central heated marble treatment bed, and a relaxation room on the mezzanine level. Cinq Mondes and Carita are the luxury products used in the spa treatments which are presented as gastronomic treat with a menu of starters, mains and desserts. So you can indulge in a 30 minute hamman to start, an anti-ageing Pro-Lift Firming Rejuvenation facial for main course, followed by a martini and manicure for dessert. A fun way to round off your deliciously pampering day at the So SPA. From cheap budget hotels to luxury 5 star suites see our special offers for hotels, including Holiday Inn Oxford Circus from 64% off.